Youth baseball tryouts need to test a variety of skills in a short time. While some sport’s leagues can focus on finding the best overall athletes during evaluations, baseball teams need to find players who excel at specific areas, like pitching and catching, in addition to fielding and batting. 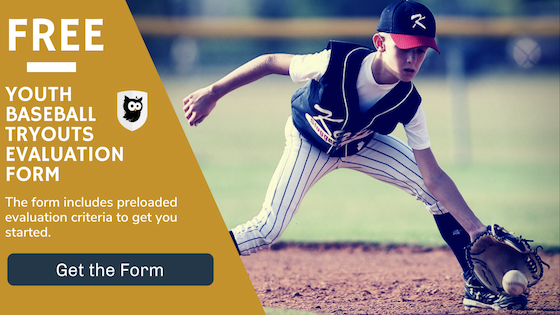 To ensure youth baseball tryouts identify the top players across various skills, teams should include drills to test players’ running, hitting, fielding, pitching. and catching abilities. Here are the top drills for youth baseball tryouts. When you think of baseball players, speed might not be the first asset that comes to mind. However, it’s important to have athletes on your baseball team who have speed to run the bases. It’s also important to have smart base-runners on your squad. To find these skills, teams should consider conducting drills that test speed alongside base-running knowledge. Chat tryouts with one of our inhouse experts. Request you free assessment. To check speed, teams can set up a traditional sprint test over a specified length. If teams are just looking for overall speed, the distance should be measured in a straight, clear path. Evaluators should have a working stopwatch and record each player’s time. To test athletes’ base-running skills, teams can set up situational drills. Using bases and a base path, those conducting the drill can have players react to specific situations. These can include a force out where athletes need to slide or situations where athletes need to tag up, like on a long pop fly. Teams can also instruct players to watch base coaches for signals on how to move along the bases. This can help determine the players’ base-running IQ. Being able to hit the baseball is a fundamental skill players should possess. Clubs also need a variety of hitters, including power hitters and lead-off hitters. To test players’ hitting abilities during tryouts, teams should have each player bat for the same amount of pitches. For consistency, teams should either use a pitching machine or the same pitcher for all athletes. Set a pitch count (at least 10 so players have time to get comfortable in the batter’s box) and record how players react to each pitch. Evaluators should mark if the player resisted swinging at bad pitches, how hard the ball was hit, and where it went in the field. Evaluators and coaches should also pay attention to each batter’s swing to see if it is fundamentally sound. For an additional youth baseball tryout drill, teams can teach players a handful of signs, then give them to each athlete when they are at the plate. Teams can record how well the player was able to read the signs and execute on the desired outcome. Help players be prepared for tryouts. Use this checklist as your guide. Teams should run a variety of fielding drills at youth baseball tryouts. Clubs need to determine how athletes perform defensively, as well as their throwing abilities. One drill teams can run is having players field hits from coaches. A variety of hits should be given to each player, including grounders, pop flies, bunts, and line drives. These will show evaluators how players react to each type of hit. Teams should also test how well players move to field hits. For this, balls should be hit in various locations to see how well a player moves and gets himself into position. Athletes should be tested both in the infield and the outfield. Clubs also need to test how well players can make a play after fielding a hit. To test this, players should be given situations, such as the play is on first, there is a force out on second, etc. Then after the player fields the ball he will need to throw it to the designated base. This will help determine how well the player can make a required throw and how well he can read situations to get the ball to the correct teammate. For infielder-specific drills, players can be put into situations where infielders need to cover for each other. Athletes can also be asked to throw from third to first, or shortstop to first to test the strength and accuracy of each player’s arm. Outfielders can also be asked to throw from the outfield to their cutoff, and then into specific bases to test their accuracy and strength. Now that you have the the drills for baseball tryouts, here are some tips to help tryouts run smoothly. For pitching drills, teams should only include players who are trying out to be a pitcher. Teams can give each player a pitch count and have them throw to either a catcher or a coach. Each pitcher should get the same amount of pitches. Teams can designate what types of pitches they want to see thrown and how many of each. Evaluators should grade on accuracy, speed, and pitch variety. Here are some additional tips on how to prepare your evaluators for tryouts. Like pitching drills, only those specifically trying out for Catcher should be included in the catching drills. For these drills, catchers should be in full gear. They can either catch for pitching candidates or for coaches. Catchers should have to field a variety of pitches. Evaluators should track how many pitches got passed a catcher and if any wild pitches were controlled. Catchers should also field hits like bunts or foul balls behind the plate to test their skills. They can also be asked to throw from home plate to various bases. Cutting players from the team can be hard. Here are some tips on how to make it a positive experience. While going through drills is important to test specific skills on players, what matters most is how athletes react to real game-time situations. To test this, teams should end tryouts with scrimmages. Depending on the number of players, teams can form multiple games to get through the scrimmages quickly. All players should have a chance to bat and play in the field to give each athlete an equal opportunity to showcase his skills. This will test how well players read signs when batting, how well they run the bases in live situations, and how well they know the game to determine where to throw to and how to respond to real game-time instances.